(SPOT.ph) Aside from Jose Mari Chan blaring through mall speakers, and Christmas trees lighting up everywhere, you know Christmas is in the air when coffee chains start launching their special holiday drinks. 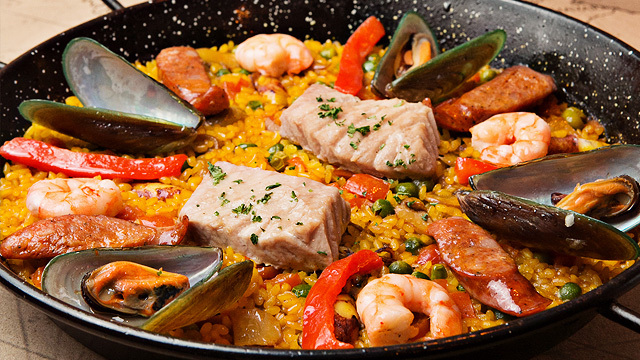 It's the happiest time of the year, so do you really need an excuse to indulge your sweet tooth? Is it really Christmas if we aren’t collecting stickers for a Starbucks planner? It’s not like downing drink after drink to fill up your card feels like much of a challenge though, especially with Starbucks’ new holiday drinks (P160/short, P170/tall, P185/grande, P200/venti). 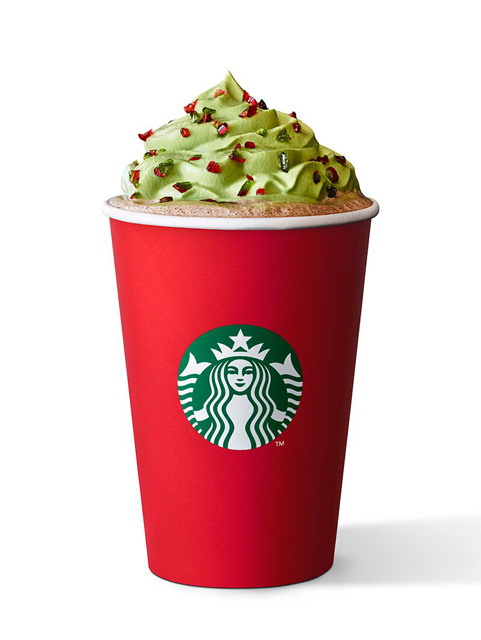 The Christmas Tree Peppermint Dark Mocha, a dark mocha blend of green tea whipped cream plus green and red candy sprinkles is sure to put you in a festive mood. 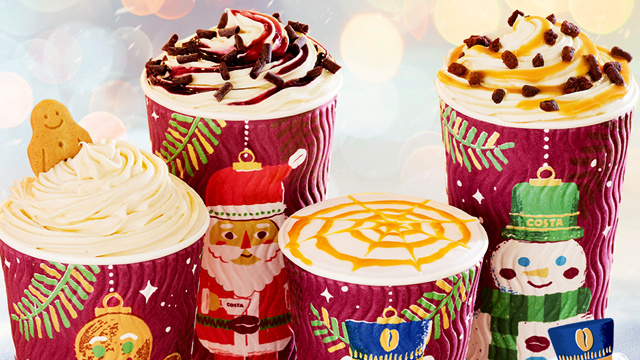 They’ve also brought back two bestselling holiday flavors: The Vanilla Nougat Latte with French vanilla and nougat, and the Toffee Nut Crunch, with toffee nut syrup, steamed milk, whipped cream, and crunchy toffee nut toppings. 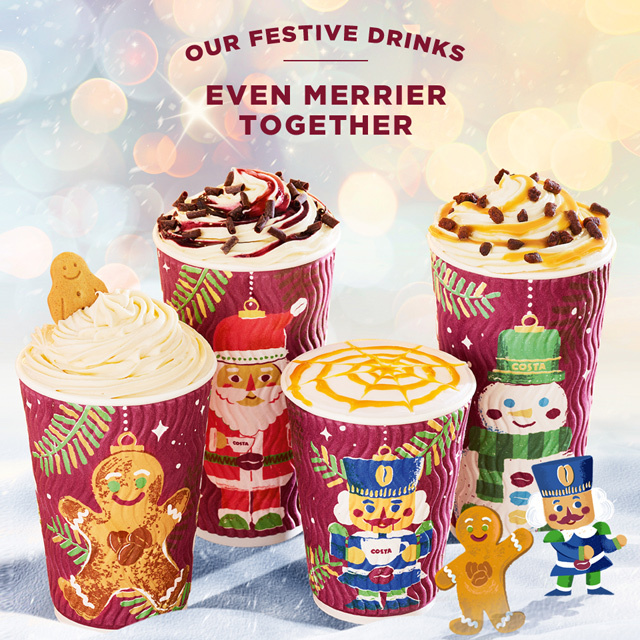 Christmas is the perfect excuse to indulge so Costa Coffee is treating you to decadent drinks for the holidays. Satisfy your sweet tooth with The Billionaire’s Hot Chocolate (P155/Primo, P165/Medio, P175/Massimo) with caramel sauce and chocolate cookie crumbs. If you prefer sugary coffee drinks, treat yourself to a Gingerbread Latte (P145/Primo, P155/Medio, P165/Massimo) or a Salted Caramel Cappuccino (P145/Primo, P155/Medio, P165/Massimo). Costa Coffee’s signature Frostinos are also not immune to the holiday spirit: Choose from a Black Forest Frostino (P175/Primo, P185/Medio, P195/Massimo), Gingerbread Frostino (P175/Primo, P185/Medio, P195/Massimo) or a Billionaire’s Frostino (P165/Primo, P175/Medio, P185/Massimo). 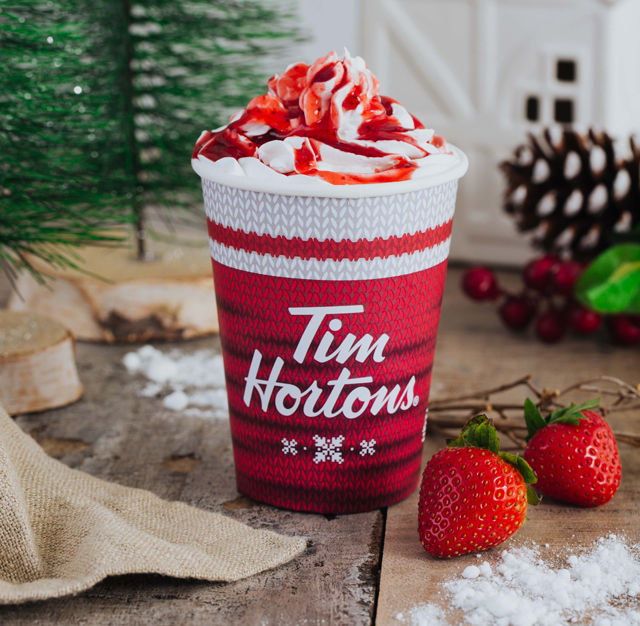 Tim Hortons knows that nothing says Christmas better than hot chocolate, so they’ve whipped up their own version for their special holiday menu: The Merry Berry Hot Chocolate (P125), a dark chocolate drink with whipped cream and strawberry sauce that is sure to warm you up. But if you still prefer something a little chiller, have the frozen alternative, the Merry Berry Choco Chill (P145), with strawberry syrup and a topping of whipped cream and dark chocolate shavings. Can’t live without caffeine? You won’t feel left out with the Rudolph Red Velvet Latte (P145), an espresso-based drink with cocoa and red velvet powder. See a list of Tim Hortons branches. Why have coffee and cake separately when you have both in one drink? 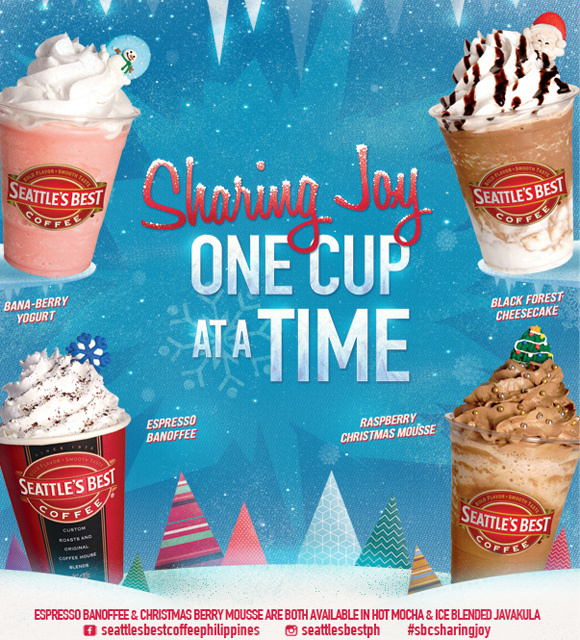 The holiday menu of Seattle's Best Coffee turns some classic cakes into drinks like the Black Forest Cheesecake, Espresso Banoffee, and Raspberry Chocolate Mousse. For something lighter and fruitier, you can also try the Bana-berry Yogurt. 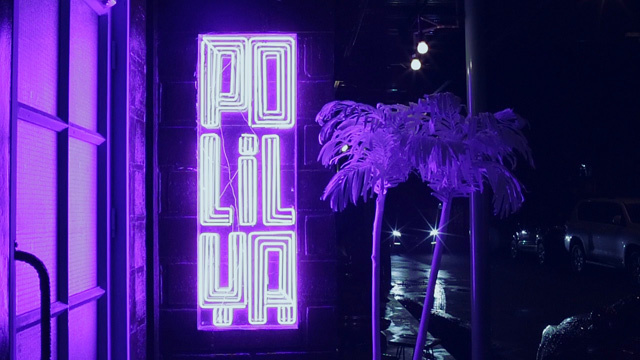 See a list of Seattle's Best Coffee branches. 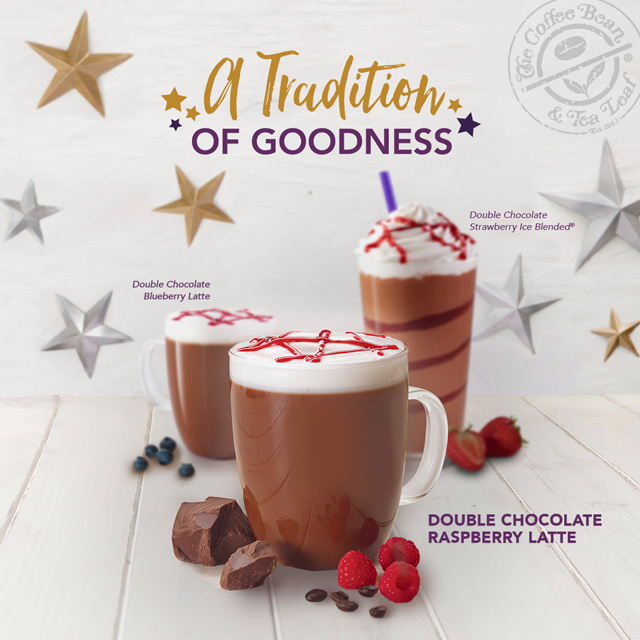 Nothing beats a classic combo like berries and chocolate, so we’re sure CBTL’s new holiday drinks will hit just the right sweet spot. Berry fans have three different syrups to choose from: Strawberry, blueberry, and raspberry. These are then drizzled generously in a blend of rich dark chocolate and espresso, which you can get either as a warm or iced latte (P150/small, P165/regular, P180/large) or as an ice-blended drink (P175/regular, P195/large).